He borns close to a volcano, When he was a baby, he got kidnapped by a Spearow and rescued by Articuno, the Spearow send him far of his home and his family, in a forest, the Articuno who saved him disappeared and a feather was the only thing he leaves. He started a new life and learned how to survive being helped by Keckleons. After a while, he know new friends and started to travel along with Snibriela, Ari Chespin, Minchie and Hunter. In his travels he found a lot of stuff that he wears. Ribbons, clothes, a broken pokeball, etc. Has a lot of tatoos in his belly, feet, arms and head. Wears a loincloth, behind of this are visible his male parts. Wears two anklebands and two spiked wristbands. A gold brazelet in his left arm. A sapphire necklace with a peace symbol on it, that has two pearls and a ruby. Lindos accesorios. Muy detalladito x3 Me gusta el nuevo look. 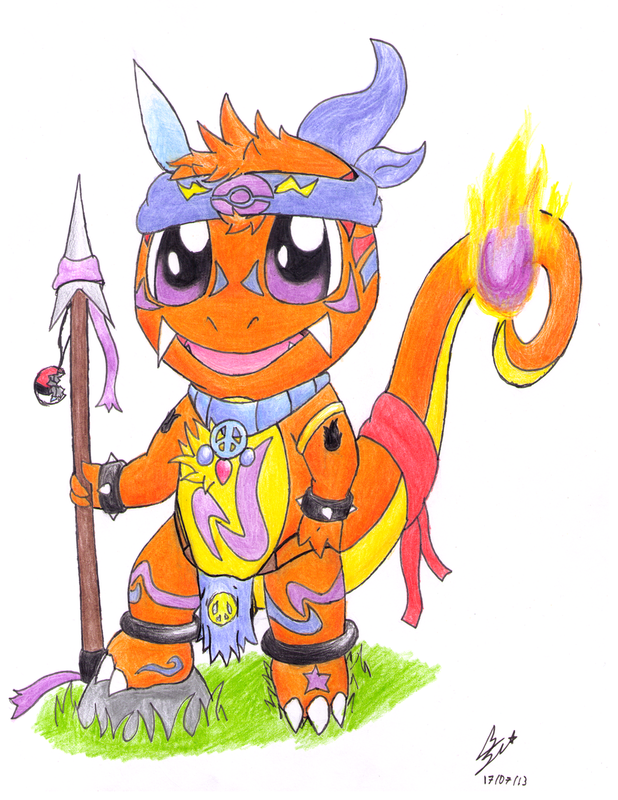 CHARMANDER 2.0!!! Can I hug you?